Today Wi-Fi is everywhere, however, we more often than not still need to depend on flash drives up save our files and pens to make notes, especially in the office. Therefore, we suggest this unique corporate gift idea for your office supplies – a 3 in 1 USB pen. This USB pen is fully customizable. Your companies logo can be placed on it. You also can choose a color that matches your logo or your company color. This USB pen looks practical and stylish and has an ideal design fit for any company. To use the USB just remove it from the top of the pen and you have two useful items! Why use a customizable USB pen with a stylus as a business gifts idea? Practicality. This is a promotional USB, pen and stylus at the same time. Can be used to note take, sign documents, navigate around your smartphone or tablet and great for carrying all your electronic documents with you. That these are the things which we constantly use at work! On any occasion when a USB is required urgently, this product will definitely come in handy. Enhance brand visibility. Business people usually use pens not only at work but all the time. In this case, a promotional pen can catch attention and provoke curiosity. So if we will place your brand’s logo on this item you could achieve great brand visibility. Brand value. 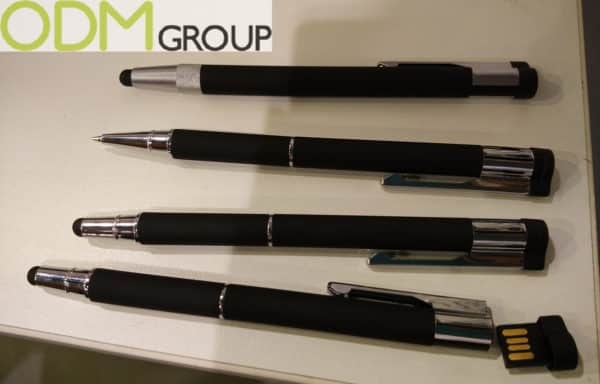 In order to encourage your clients and partners, you could also give these three-in-one pens to them. These pens are of very high quality, therefore, we are sure that they will appreciate your promo gift. You could remind your clients or partners about your company and brand as they use the pen. If you like this promotional product, contact us today and quote ODM-1270. Here at ODM, we have significant experience in product design, product sourcing and product manufacturing. Our product designers will be able to provide you with multiple unique ideas to wow your audience. Our team will ensure a simple process and a pleasant experience. Similar to the product mentioned, this is another great example of a custom promotional 2-in-1 pen that many businessmen will find useful and use frequently. Read this blog to find out why we love this promotional idea! USBs are extremely useful, and what is greater is that it is part of a pen. This means that you can easily carry one around with you without hassle or worrying that it will go missing! Not only we gave examples of a 2-in-1 USB and pen, but we also have other fun and interesting examples of how you can accommodate a USB in your custom promotional products.